Indoor exercise machines make the lives of runners easier. People who come home late, don’t want to run in the dark or the rain, or want an easier time tracking their stats can use devices like treadmills. Many treadmills now monitor the user’s progress and provide a safe, consistent environment for runners to practice. However, not all treadmills are the same. They have different prices, special features, and can even provide varying workouts based on design and how much resistance they add. 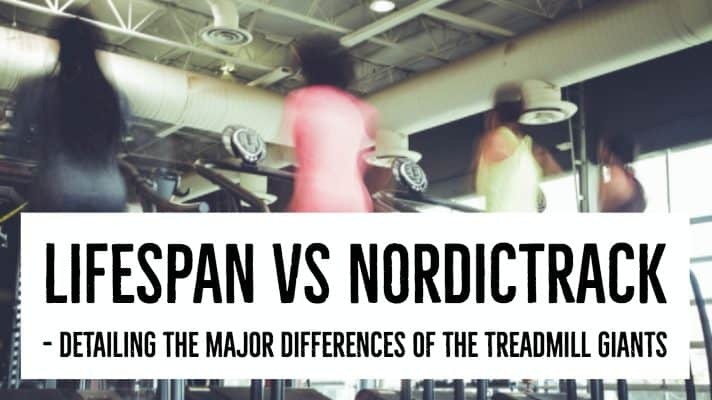 Out of all of the treadmills on the market, two of the most well-known brands are the Lifespan and Nordictrack. Both provide an excellent workout, but could one be better than another? We detail some of the major differences. Some people see running as energizing while others consider it punishment. Throughout its existence, the treadmill has actually been both. Rudimentary treadmills were used for power for over 4,000 years. They could be pushed by humans or large animals like oxen for a variety of tasks, including grinding grain. These treadmills also performed difficult tasks such as lifting buckets of water or kneading dough to make loaves of bread. More recently, treadmills were used as punishment. According to the Encyclopedia Britannica, Engineer Sir William Cubitt installed stair-like treadmills in jails to punish inmates, enforce exercise, and also power machines using the energy of prisoners. These devices were exceptionally cruel as prisoners had to walk on them for six hours a day, climbing up to 14,000 ft. and supplementing the power of nearby mills. A treadmill as an exercise machine, where people willingly took part, didn’t develop until the early 20th century. However, a more standardized design wasn’t implemented until the 1950s, when treadmills were medical machines that could measure heart rate, as mentioned by LifeFitness. Scientists began to see more of the device’s benefits, and regular people began to use them to become healthier. A lot of runners enjoy treadmills because they offer a simple, no-frills workout with plenty of variety. Most models include features that allow the elevation and speed to change so users can train for hills, flat land, and even regular terrain. A machine is a true treadmill when it has a moving band that allows the user to run without going anywhere. 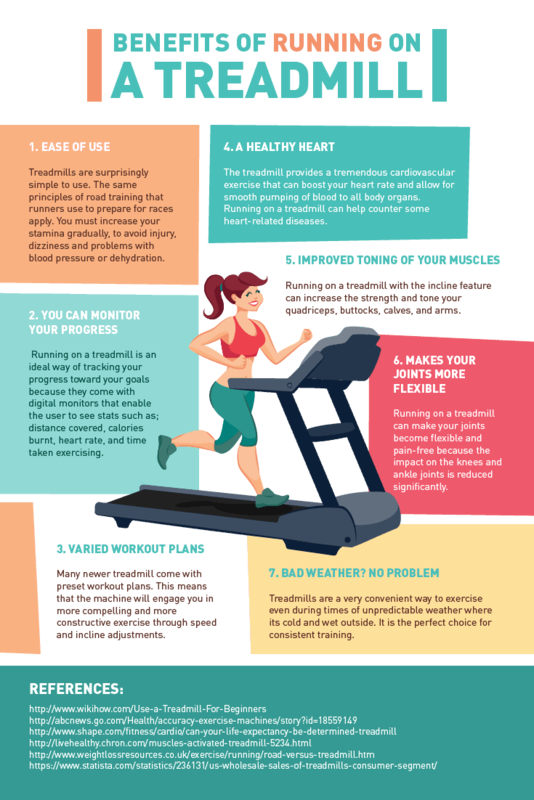 There are quite a few benefits to using a treadmill. First and foremost, the runner doesn’t have to go outside. Many people enjoy the outdoors, but that doesn’t mean they want to run during a thunderstorm or sweltering 90 degree weather. Instead, they can start up the treadmill, adjust the settings, and enjoy their run without worrying about being struck by lightning or severe dehydration. We break down in detail some of the other benefits including being able to completely control the environment for the exercise, heart rate monitoring, and easy calorie tracking in this article. Many runners have their health in mind and most modern treadmills include equipment that monitors basic health statistics. This means users who have a set heart rate, calorie goal, or incline in mind can find it easily. Many runners will additionally be disheartened by the price, since most machines cost between $1,000 and $3,000. Despite these setbacks, people enjoy being able to run in a controlled environment and, for many, the benefits continue to outweigh the negatives. LifeSpan Fitness opened in 2001 in Utah and provides equipment for commercial and residential properties alike. This means you might see one in the gym but could also get one to use in your own home. The company specializes in machines which sell for middle of the road prices, usually between $1,000 and $1,500. LifeSpan offers folding and non-folding treadmills to complement any runner’s lifestyle and exercise regimen. The company is well-known for its cushioning and manufactures a variety of machines. All of them have 15 levels of incline, equal to an 8.5% slope, and strong but lightweight motors. Most models come with lifetime warranties for the frames, which is beneficial for especially active athletes. The smaller devices do have weight limits around 300 lbs., which can be difficult for some. Each model has 6 to 8 compression shocks, which help absorb some of the force generated by your feet hitting the machine. The typical range of speeds on a LifeSpan device is between 0.5-12 MPH. Some models will only go to 11 MPH to help runners spend less money on a stronger motor. All standard models record heart rate, calories burned, and the speed of the user. Their two most popular are the TR1200i and the TR400i. Both units have training programs strong motors, and the standard features mentioned. 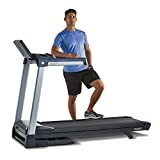 Nordictrack is a well-known manufacturer of exercise equipment like ski machines, low impact ellipticals, and commercial and folding treadmills. Most machines cost between $700 and $2,000 with a broad range of variation to suit different athletes. The majority of its treadmills come with lifetime frame warranties, 25-year warranties on the motors, and 1-year warranties for other parts. Most models can reach a slope of 8.5% to 10% and the incline can be adjusted gradually. The motors tend to be lightweight but strong, and most devices have a weight limit of approximately 300 lbs. Runners can choose from a variety of additional features, including fans, connections for iPhones, and cup-holders. Most Nordictrack devices range in speed from 0.5-12 MPH, although some smaller machines only reach 10 MPH. The treadmill tracks important health information like heart rate, calories burned, the user’s weight, and the general speed of the runner. 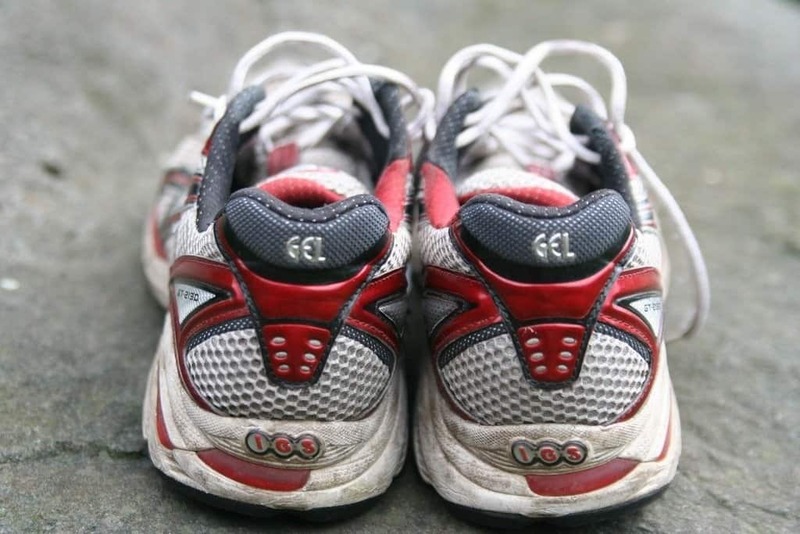 Many models have extra cushioning and suspension to reduce injuries and the tension on a runner’s ankles, knees, and hips. 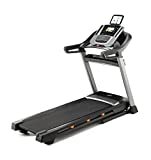 Below are the two most popular NordicTrack treadmills - the T6.5S and the C990. Both of which have unique features found only with NordicTrack. 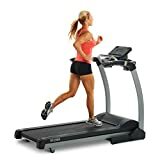 Both LifeSpan and Nordictrack produce high-quality treadmills with a plethora of features, so comparison can be a bit tricky unless you have a specific model in mind. However, there are some consistencies across the brand. 1. LifeSpan is considered a boutique producer of treadmills, which means its name sometimes takes the company further than the features in its equipment. It caters largely to runners interested in slim, lightweight models with some extra technological features, like connections for phones and other devices. 2. LifeSpan additionally tends to charge more for the same features when compared to Nordictrack. 1. LifeSpan has more cushioning than Nordictrack, while Nordictrack models tend to have more of an incline so people can work out more of the muscles in their legs. Nordictrack also has more warranties on equipment. 1. Despite these positives, Nordictrack does not have the best reputation when it comes to customer service, and their motors can wear down quickly from daily use. However, people tend to receive more features for their money and the Nordictrack frames are slightly larger and designed to suit runners of different shapes and sizes. So, what does this mean for you? Luckily, it means both brands are excellent choices for athletes. However, it you are interested in a machine that holds up during daily use, a LifeSpan is more likely to suit your needs. If you want something reliable and affordable, but don’t run as often, then Nordictrack would work the best. LifeSpan and Nordictrack both produce excellent treadmills. Choosing one can be a difficult process for a runner. It’s important to test the model you are interested in before investing in a purchase so you can ensure you have the right one for you. If possible, visit a store that sells both brands so you don’t feel pressured to buy a specific one by the person selling equipment. ​Sole Treadmill vs Nordictrack – Which Treadmill is Better ?